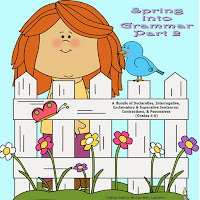 This is the second part of my spring grammar bundle for grades 4-6. 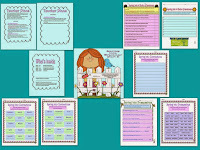 It contains worksheets to help reinforce the 4 types of sentences (Interrogative, Declarative, Imperative and Exclamatory), Contractions and Possessives. 1. If the sentence is Declarative put a D on the line, if the sentence is Imperative put an I on the line, if the sentence is Interrogative put a ? on the line , if the sentence is Exclamatory put an E on the line. Put the correct punctuation at the end of the sentence. * Some sentences may be Imperative and Exclamatory, so put I, E .
1. Write the contraction for the words you see in the box. 2. Write the long form of the contraction. your, hers, your, ours, their). One word is used twice. 3. Choose 10 possessives and write a sentence for each one. Copyright © 2014 Deann Marin (Socrates Lantern). All rights reserved by author. Permission for downloads to copy for single classroom use only. Electronic distribution limited to single classroom use only. Not for public display.